Serving Roanoke, Virginia, and the surrounding areas, the law firm of Ferris & Eakin meets a broad range of legal needs, including: personal injury; wrongful death; estate administration and planning; estate disputes and litigation; traffic violations and DUI. We believe experience matters in the practice of law. 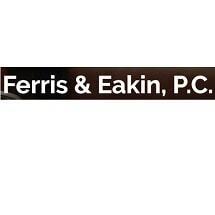 Founded in 1988, our firm is led by Ray Ferris and Lenden Eakin, both of whom have been attorneys for more than 30 years. Ray Ferris graduated from Roanoke College in 1976. He earned his law degree in 1982 from the University of Richmond and then returned to Roanoke to work as a prosecutor. Today his private practice focuses on personal injury plaintiff's litigation, criminal defense and traffic defense. Lenden Eakin graduated from the College of William and Mary in 1979. He earned his law degree in 1982 from the University of Richmond. He then served as Estate and Tax Planning Specialist for the Federal Land Bank of Baltimore. His practice concentrates on personal injury, estate litigation, estate planning and estate administration. Outside of the office, Mr. Ferris has been a Roanoke City Council member since 2010. He was re-elected in 2014. Mr. Eakin has a military background. He served for 11 years as an officer in the 29th Infantry Division of the Virginia Army National Guard. We strive to build long-lasting relationships with our clients, many of whom have been with us for decades. If a client's case requires knowledge that is outside the firm's practice, we maintain a network of lawyers and experts who can be brought in to help. Similarly, attorneys throughout Virginia frequently refer cases to us. No matter your legal needs, we will work tirelessly to develop effective, sensible solutions.